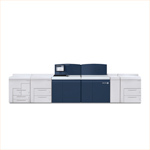 Take your business to rewarding new levels with the Xerox Nuvera? 200/288/314 EA Perfecting Production System. This easy-to-use, flexible system is built on a strong foundation of exceptional image quality, speed, efficiency and productivity to get your business growing. Media size: Min: 5.5" x 8"